familial tragedy after another in Before the Devil Knows You’re Dead. Where to begin with this masterpiece? When I really dig a movie, I take notes. Lots of notes. Even though my notepad is only big enough to fit in my pants’ pocket, I took nine pages of notes during Before the Devil Knows You’re Dead. That’s how much I loved this movie. 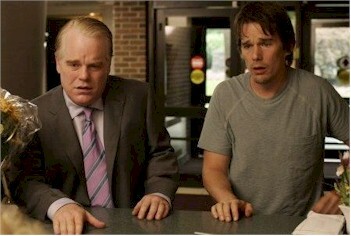 Basic plot stuff: two brothers (the elder Andy played by Phillip Seymour Hoffman and Ethan Hawke as the younger Hank) who both need money decide to follow through with a plan to rob a small mom-and-pop store in the suburbs in order to get some dough. However, plans don’t always work out like they’re supposed to, and people get hurt in the aftermath of blame and consequences of anger and fear. The crime movie is redefined by the man who perfected it. Sidney Lumet, the director of Serpico, Dog Day Afternoon, Deathtrap, and countless others, has made a film that I predict will become a kind of stand-out classic of the decade, like what Cutter’s Way is for the 1980s. The cast is not quite large enough for me to consider an “ensemble” but full of big-name actors, beyond top-notch and floating somewhere in the realm of the miraculous. Hoffman is great as usual and reminds us that even though he has won an Oscar already, he should’ve been nominated for one way before Capote. Hawke shows the same intensity he lay bare in Tape and doesn’t miss a beat. Tomei, as Andy’s significant other, does her best work since In the Bedroom (or My Cousin Vinny, if you prefer). Albert Finney, possibly the best living actor, plays Andy and Hank’s father, flipping between enraged and grief-stricken and volatile with utter ease. As director, Lumet proves he isn’t a bit rusty. At 83, Lumet has grown greatly and shows that he doesn’t need to steal from a legend to show he is a mature filmmaker (unlike Tarantino and some of his colleagues who depend a little too much on homage). He is his own legend, like his contemporary Hal Ashby before him, who speaks in no particular style but makes incredible movies. The film gets its title from an Irish toast that goes, “May you be in heaven half an hour… before the devil knows you’re dead.” I believe, though, that the title was chosen because it can be interpreted another way (aside from the “toast” implications of hope and wishing luck): stay in you’re “happy place” as long as you can before reality hits you in the face. I’m fascinated mostly by movies about people who are disillusioned by their fantasies, which only brings their reality to a downward spiral. Lumet explores this theme, and many others, with great interest. 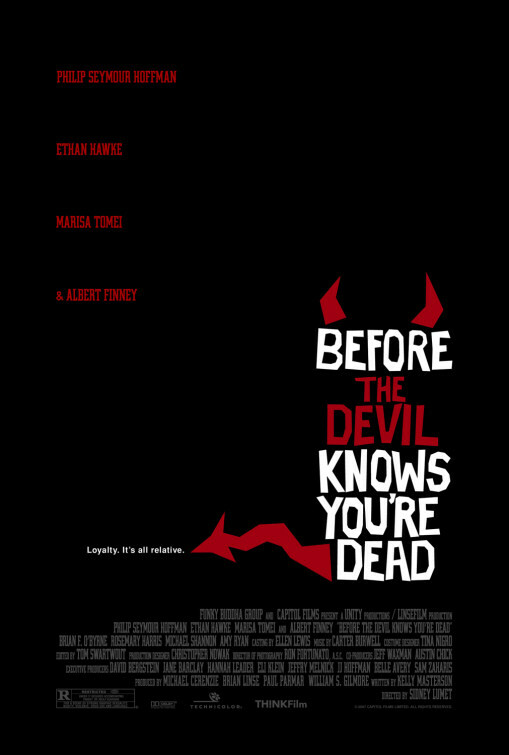 Before the Devil Knows You’re Dead ends up being a movie not about plot or even character. Even though the ending seems to come abruptly, there is closure as we realize the movie is about themes and how they interact with each other. Would it be rash to say that Lumet, the director of 12 Angry Men, Network, and The Verdict, has made one of his best films with Before the Devil Knows You’re Dead? I wouldn’t hesitate to say so one bit.